Wendy's has spent 2018 splitting time between flipping square burgers and flinging mud at McDonald's. It's not even like there was one spat blown out of proportion. It has been constant. Wendy's took out a Super Bowl ad going after McDonald's. Then it spent the Super Bowl taking shots at the Golden Arches on Twitter. There was also that time McDonald's announced it was going to use some fresh beef and, of course, Wendy's seized on that opportunity. That was followed by the Wendy's mixtape poking fun at the home of the clown. 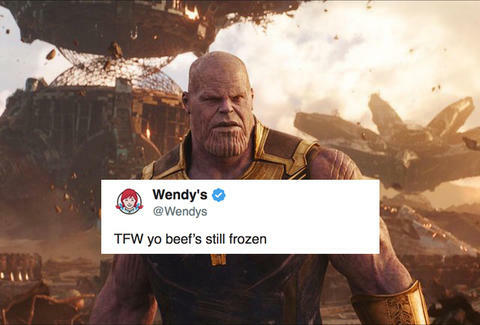 Wendy's went after McDonald's again on Tuesday, using an Avenger's meme for another pot shot about frozen beef. Earlier this year, McDonald's announced that all locations would use fresh beef for Quarter Pounders and Signature Crafted burgers by the end of the year. That, of course, leaves many burgers, including the Big Mac, to be made with frozen meat. Let's keep this spoiler free and say the meme Wendy's is using is about the end of Avengers: Infinity War. (If you want to know details, here's more about that meme and the ending of Infinity War.) The moral is that Wendy's will take any opportunity it can to remind it uses fresh beef and its competitors aren't always doing the same. If you want to best the snarky Twitter account, you either need painfully cheesy raps, poop jokes or you actually have to have one up on them.